To celebrate Fairtrade Fortnight 2015 fairandfunky held their first ever fairandfunky Fairtrade Conference for Schools on Mrch 6th. The conference was fully booked with 80 students and 20 teachers from across Kirklees coming together to celebrate and learn about Fairtrade in creative workshops from Shared Interest, Sea Pie Parcel, Coeur de Xocolat and fairandfunky. In a chocolate workshop with Coeur de Xocolat students discovered all about the journey of chocolate from bean to bar, watched a video about life as a cocoa farmer and took part in a chocolate tasting session! And the chocolate theme continued with Shared Interest as students were challenged to create their own design for a new brand of chocolate bar. In the fairandfunky workshop students were asked to look closely at the Fairtrade Mark: “What do you see?” “What colours can you see?” Through discussion, students discovered that the Fairtrade logo represents the world and the people who live in it. The blue is the sea and sky, the green is the land, and the black is a person with their hand held high. When you see the logo you are reminded to think about the people behind the product, the people who grow our food. With this in mind each child decorated a plant pot with Fairtrade packaging before planting their own seeds. The teachers also took part in their own workshop with the schools team at the Fairtrade Foundation sharing information on how to become a Fairtrade school, alongside presentations from the Conference Champion sponsors Social Progress, Riasca, Valli Opticians, Suma Wholefoods, Traidcraft and Kip McGrath Education Centres. The conference came to a close with a very special message from Allan Saidi, a Fairtrade sugar farmer from Malawi. Fairtrade really does make a real difference to the lives of farmers and their communities. Fairtrade guarantees a fair price is paid to farmers. It also pays an added premium to invest in community projects: to build new schools, improve water supplies, invest in school buses, training and education for farmers and their families and more. 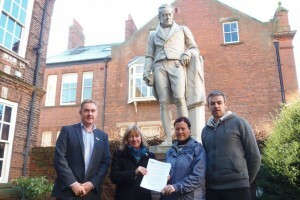 Nigel Mills, Sharon Clay, Lee-Ann Williams and Chris King of the Hull Fairtrade City Steering Group. 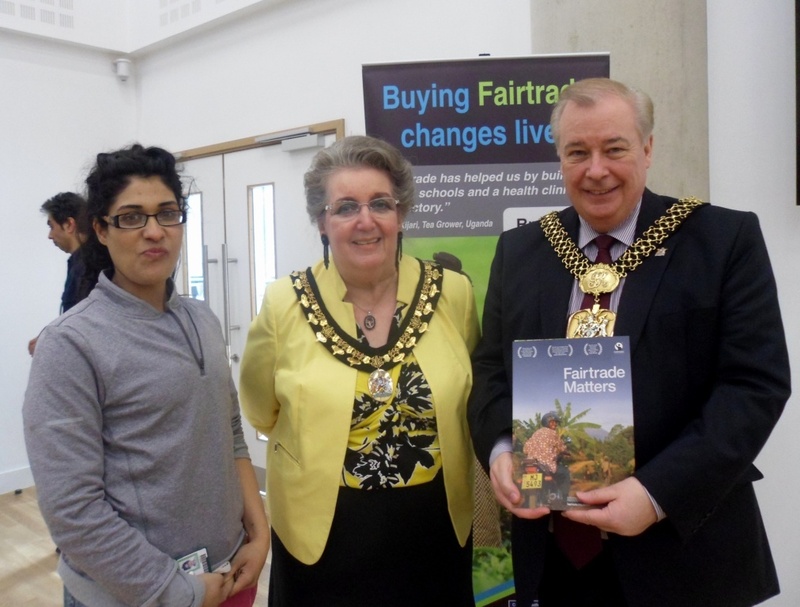 Hull Fairtrade City has been going from strength to strength in the past year. The Fairtrade Steering Group has been successfully relaunched and the city has had its Fairtrade City status renewed with glowing comment from the Fairtrade Foundation. Hull Fairtrade City enjoys the support of Hull and East Yorkshire Community Foundation, Hull City Council, Hull and East Riding Greenshare Network and the University of Hull. Coordinator of Fairtrade Hull, Nigel Mills was delighted by the group’s success. Last year Hull welcomed Fairtrade banana farmer, Aimeth from Columbia, with a school summit at Malet Lambert School and an event at the University of Hull which was attended by the Lord Mayor. The status renewal form details many exciting plans for the next two years which should see Fairtrade Hull go up to the next level. 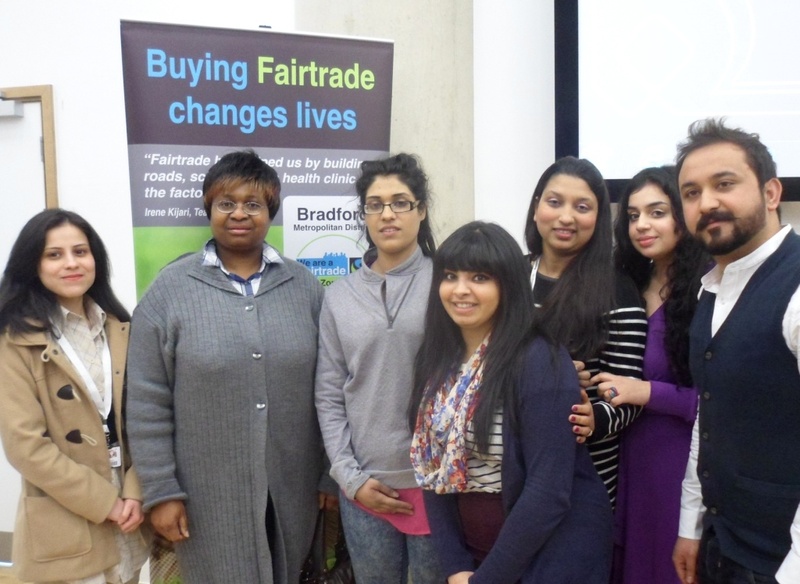 Bradford College’s Student Parliament has passed a Fairtrade Motion which now sees the college well on its way to gaining Fairtrade College status. Members of Bradford College Students’ Union celebrate the successful vote. This took place on 5th March during Fairtrade Fortnight. The vote was taken in the college’s new state of the art David Hockney building. Following the vote, a presentation was given with speeches from the College’s Group Chief Operating Officer, Gareth Osborne and Linda McAvan MEP. The Lord Mayor and Lady Mayoress of Bradford also attended the presentation. The Fairtrade Matters film was shown and then questions were taken by the Associate Director of the movie, Andy Powell. President of the Students’ Union, Fatima Sohail, with the Lady Mayoress and Lord Mayor. Fairtrade Bradford Coordinator, Karen Palframan, gave heartfelt thanks to the college for its support in the promotion of Fairtrade in the city. For the afternoon of the 5th the Fairtrade Matters movie was shown on the giant screen in the city’s Centenary Square. 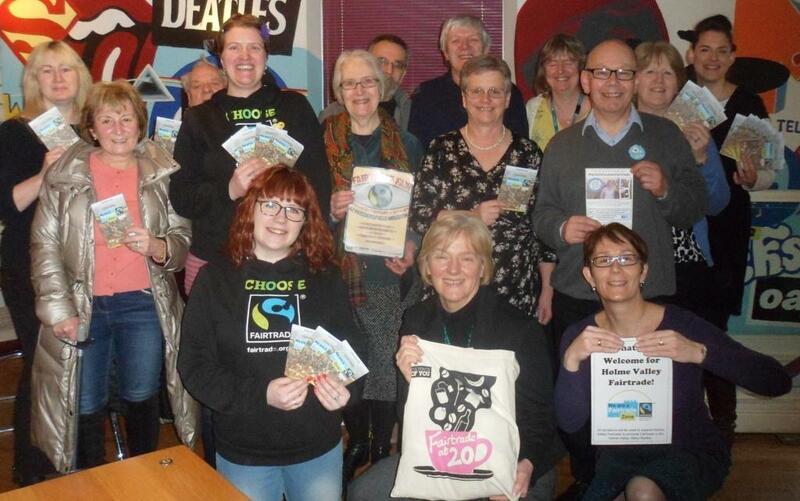 Fairtrade Holme Valley enjoyed the sweet taste of success as their new website was launched at a special event on 27th February. Held at the town’s Soul Kitchen, the web launch was attended by supporters from across the valley. The event also crossed the political divide with attendance from both Linda McAvan MEP and Jason McCartney MP. Helen Robinson, Chair of the Fairtrade Group, talked everyone through the new site and spoke of the achievements that have been made in the promotion of Fairtrade in the valley in the past few years. There has been great success in engaging local businesses and this was evident in Holmfirth during Fairtrade Fortnight when many of the businesses displayed Fairtrade posters. Some even displayed inflatable Fairtrade bananas, one of which mysteriously disappeared, but following wide media coverage across the Holme Valley was soon recovered. Haxby chocolate tasters and the winner of the ‘guess the weight of the Fairtrade chocolate cake’ competition. 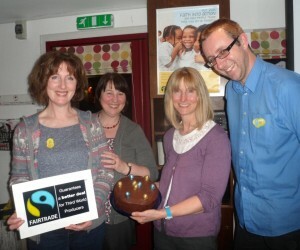 York Fair Trade Forum held a chocolate tasting at the Aroma Fairtrade Cafe in Haxby. Needless to say, it was very popular. Attendees at the event on 5th March enjoyed a wide variety of Divine Chocolate products. Completing tasting notes, the guests had to guess the flavours in the chocolate which ranged from toffee apple, to pear and ginger and even sea salt! If this were not enough, the Yorkies then enjoyed a vast array of Fairtrade cakes. The Fairtrade Foundation film, Fairtrade Matters was shown. Following the lives of tea growers in Malawi, it reminded everyone of the difference that Fairtrade makes to the lives of producers and why its important to buy Fairtrade products and demand that our retailers sell them. York’s citizens also had a chance to see the film earlier on in Fairtrade Fortnight when an event of “Films, Facts and Fairtrade Fortnight Frivolities” was held at the Basement Bar at the City Screen Cinema. The Tour de Fairtrade Yorkshire film was also shown, between music from The Spectacles, Armonia and Penny and the Poppet and a quiz. Fairtrade Skipton put up a huge sign to announce Fairtrade Fortnight to the town’s many shoppers. The banner was hung in front of Holy Trinity church which occupies an elevated position above the High Street; so it was impossible to miss. During the Fortnight Skipton’s Fairtrade group held a successful film evening at Skipton Girls’ High School. ‘The People and the Olive’ a film about Palestinian olive growers was shown, together with the Fairtrade short movie ‘Fairtrade Matters’ which features tea growers from Malawi and how Fairtrade has helped them to improve life in their communities. 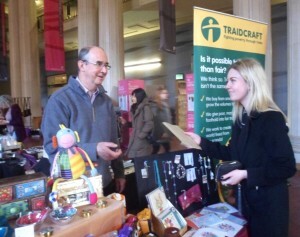 The University of Leeds held its annual Fair Trade Fair on Tuesday 3rd March in Parkinson Court. The event was a great success drawing in large numbers of students and staff who were able to sample, and purchase, a wide range of Fair Trade products. There were stalls from many businesses including the Beehive Shop, Fairer World, Oxfam and Zaytoun, the Fair Trade Palestinian olive and olive oil producers. 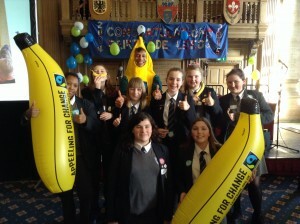 Children from 22 schools across Leeds came together to lead activities on Fairtrade, Sweatshops and Recycling at a special celebration at Leeds Civic Hall last Friday. The children used Peer Education Toolkits put together by Leeds DEC; activities designed especially for children to lead with other children. Councillor Jane Dowson and Paul Brennan (Dept Director of Learning, Skills and Universal Services at Leeds City Council) gave out certificates to reward schools for their commitment to learning about global issues, including Fairtrade.